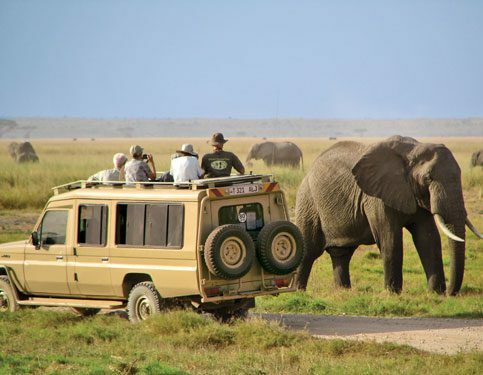 The park is located about 100 km north from Nairobi and stretches over a wide variety of terrains because it covers altitudes from about 7,000 feet (2,100 m) to 14,000 feet (4,300 m) above sea level. Established in May 1950, the Aberdare National Park covers an area of 766 square kilometers and forms part of the Aberdare Mountain Range. The park contains a wide range of landscapes – from the mountain peaks that rise to 14,000 feet (4,300 m) above sea level, to their deep, v-shaped valleys intersected by streams, rivers, and waterfalls. Moorland, bamboo forests and rainforests are found at lower altitudes. 7 Days Aberdares, Lake Nakuru, Masai Mara, Lake Naivasha,Amboseli.